Home - Do giant footprints found in the Himalayas prove the yeti does exist? Do giant footprints found in the Himalayas prove the yeti does exist? For the moment he remains resolutely invisible. But, as these pictures show, a new set of footprints has been found which offers evidence, albeit highly circumstantial, of the existence of the creature known as the yeti. An American television documentary team has spent a week in the Khumbu region of the Nepalese Himlalayas, in the shadow of Mount Everest, hunting for the so-called abominable snowman. Alas, the expedition failed to see the creature of myth, let alone bring back a pristine example for analysis. But it claims to have come across three enormous footmarks on sand and rock along the banks of the Manju River, almost 10,000ft above sea level. The best preserved would appear to be a right footprint about 13in long and almost as wide between the ends of its first and fifth toe. That is almost as large as a Daily Mail printed page. A cast was taken, which is what you see photographed here. 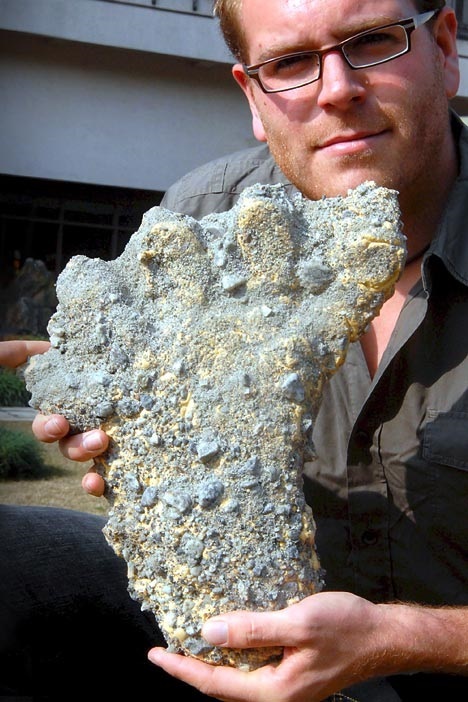 "I don't believe it to be (that of) a bear," said Josh Gates, a member of the expedition and a trained archaeologist. "It is something of a mystery for us." He said that the prints were "relatively fresh, left some 24 hours before we found them". Whether or not the prints were left by a bear, a hominid or a bare-footed mountain man with grotesquely swollen feet, the discovery will breath new life into a legend which first captured the Western imagination almost 90 years ago. The yeti - Tibetan for "rock bear" - has long been part of the local folklore in the Himalayan region. Accounts of its size, shape, colour and habits vary from valley to valley. Most agree, however, that it is rooted in magic and generally to be avoided. The first authoritative description of the creature and its legend was in 1889 by the British explorer Major L A Waddell. While journeying through the snow in north-east Sikkim he came across a set of large footprints which his servants claimed were made by the yeti. The servants said it was highly dangerous and fed on humans. The Major wrote: "Some large footprints in the snow led across our track and away up to the higher peaks. These were alleged to be the trail of the hairy wild men who are believed to live among the eternal snows, along with the mythical white lions whose roar is reputed to be heard during storms. The belief in these creatures is universal among Tibetans. None, however, of the many Tibetans I have interrogated on this subject could ever give me an authentic case." The Major thought the tracks had been made by a bear. Few were interested in this piece of local colour, until an expedition in 1921, which catapulted the yeti into the international imagination. A Royal Geographical Society (RGS) expedition to Everest reported footprints in the snow at 21,000ft. Team leader Lieutenant Colonel Charles Howard Bury thought they were those of a wolf, but his Sherpa guides attributed them to a wild man of the snows, which they called metoh kangmi, one translation of which is "manbear snowman". When the expedition returned to India, the porters were interviewed by a freelance journalist called Henry Newman. He is responsible for the term "abominable snowman" having mistranslated the word 'metoh' to mean "filthy", which he then exaggerated to "abominable". Shortly afterwards, another Englishman reported an encounter with a creature he said he assumed to be "the snowman". "Almost stark naked in that bitter cold... He was a kind of pale yellow all over, about the colour of a Chinaman, a shock of matted hair on his head, little hair on his face, highly splayed feet, and large, formidable hands. His muscular development in the arms, thighs, legs and chest was terrific. He had in his hand what seemed to be some form of primitive bow." In 1925, during another RGS expedition, there was one more alleged sighting. "Unquestionably, the figure in outline was exactly like a human being, walking upright and stopping occasionally to pull at some dwarf rhododendron bushes. It showed up dark against the snow, and as far as I could make out, wore no clothes." The locals claimed it was a demon. The 1950s were the golden years of yeti-spotting. The interest was sparked by the British Everest Reconnaissance expedition of 1951 which brought back clear photos by Eric Shipton of strange tracks high on the mountain. "They seemed to have come over a secondary pass at about 19,500ft, down to 19,000ft where we first saw them, and then went on down the glacier," one climber later explained. "We followed them for the better part of a mile. What it is, I don't know, but I am quite clear it is no animal known to live in the Himalaya, and that it is big." Sceptics said they were animal tracks which had been distorted by wind or ice movement. Nonetheless, the pictures caused a sensation. Yetimania was reborn. The conquest of Everest two years later only heightened interest, especially as more strange footprints were noted during the assault. For the record, the two men who reached the summit disagreed on whether or not the yeti existed. Sherpa Tenzing Norgay claimed to have seen one in 1949 - reddish brown-haired and "half-man half-beast". Sir Edmund Hillary remained very sceptical. The most determined effort to prove or lay the legend to rest was made by this newspaper in 1954. The Daily Mail funded a 16-week "Abominable Snowman Expedition" to the Himalayas. No creature was seen, though a number of unexplained footprints were noted. Relics which locals claimed to be yeti scalps were found to be taken from the hides of other animals. It was a great adventure, but not the conclusive scoop that had been hoped for. And so other unsubstantiated reports have followed down the years. In 1958, villagers reported having found a drowned yeti. It was not produced as evidence. Western climbers have seen strange animals at altitude from a distance. Others have heard wild cries in the night and found tracks. It all added to the myth. Indeed, inspired by the Mail expedition, Hammer Films made a horror flick called The Abominable Snowman. "It was too horrible to bring back alive!" screamed the poster. "A cave was the trap: a human being was the bait!". Naturally, the actors find the yeti. And, it being a Hammer film, a yeti's death unleashes horrible revenge amid the snows. You mess with a yeti at your peril. The myth continued to grow. 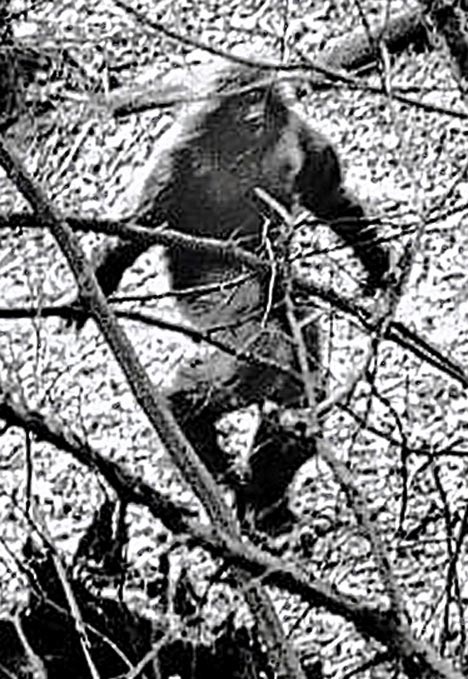 Sightings of an 8ft yeti-like creature named Bigfoot were claimed in America, with photographic "evidence". But what of these new footprints. Is fact as strange as fiction? Ang Tshering, president of the Nepal Mountaineering Association, said he had talked to the U.S. film crew and heard their story, but was not convinced they had found yeti prints. "It could most likely be footprints of the mountain bear which is found in the area," he said. "They showed five toes in the footprint cast they brought back, but according to the legends we hear from the villagers the yeti is only supposed to have four toes." However, Tshering does believe that there is something out there, wandering the high Himalaya, of which man has yet to learn fully. "A mysterious animal does exist in this region, but that does not mean it is a yeti," he said. One day, perhaps, the world's most elusive biped will prove itself to be more than just a spine-chilling myth. For the moment we will have to follow in its footprints.